Capping its annual Independent Film Week, IFP announced the recipients of this the annual IFP Market Awards at a luncheon in Manhattan on Thursday afternoon. Actor Giancarlo Esposito joined IFP executive director Michelle Byrd at the ceremony, which presented cash prizes to the 2006 award winners. Meanwhile, The Fledgling Fund sponsored two awards, honoring Yoruba Richen and her new project “Promised Land” with the Award for Socially Conscious Documentaries, which includes a $10,000 cash prize. While the Award for Emerging Latino Filmmakers went to Vivian Lesnick Weisman for “The Man of Two Havanas,” including a $10,000 cash prize. Richen’s “Promised Land” explores two black South African communities as they try to reclaim ancestral land and Weisman’s “The Man of Two Havanas” explores a man who runs Radio Miami, including top secret audio tapes of an infamous Cuban terrorist. Scott Teems, writer of “I Hate to See That Evening Sun Go Down” and Sean Patrick McCarthy, writer of “Pansy” shared the IFP Market Emerging Narrative Screenplay Award, and the $5,000 cash prize (from Artists Public Domain). Teems’ “Evening Sun” is, in the words of an announcement, the story of a man who flees a nursing home to return to his Tennessee farm, but discovers it has been sold to a redneck family, while McCarthy’s “Pansy” looks at a sexual relationship between a 15-year-old boy and an older man. Thursday’s event concluded with the formal presentation of the Chrysler Film Project award from the car company and Silverwood Films. Announced Monday at the IFP Market’s opening night event, Derek Cianfrance‘s “Blue Valentine” was chosen as the winner of the major prize, a $1 million feature-financing deal. Jamie Patricof and Alex Orlovsky of Hunting Lane Films, producers of “Half Nelson,” and Lynette Howell of Silverwood Films are on board to produce the movie, in association with Radical Media and Doug Dey from Silverwood. “Blue Valentine is described as, “the story of a couple breaking up and, ten years earlier, falling in love. 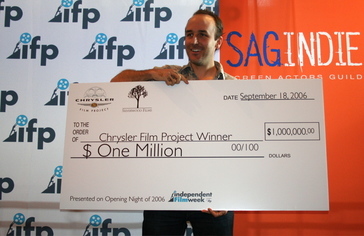 The film juxtaposes dualities – love versus hatred, the past versus the present, fantasy versus reality, youth versus adulthood, man versus woman – to present a portrait of an American marriage.” Cianfrance’s first feature, “Brother Tied,” debuted at Sundance in 1998 and he has since directed numerous commercial and branded content projects.